Did you ever wonder where and how the current Internet had its birth? Well... it started at three locations in California and one in Utah with "IMP" (Interface Message Processor) gateways (now, called routers) developed and implemented by brilliant engineers. That successful 4-node experiment in 1969 led to the massive interconnection that spans the globe today. And, amazingly, the transfer protocol used then, continues to be used today. Shown below is the hand drawn sketch by the renowned Vint Cerf (one of the fathers of the Internet). 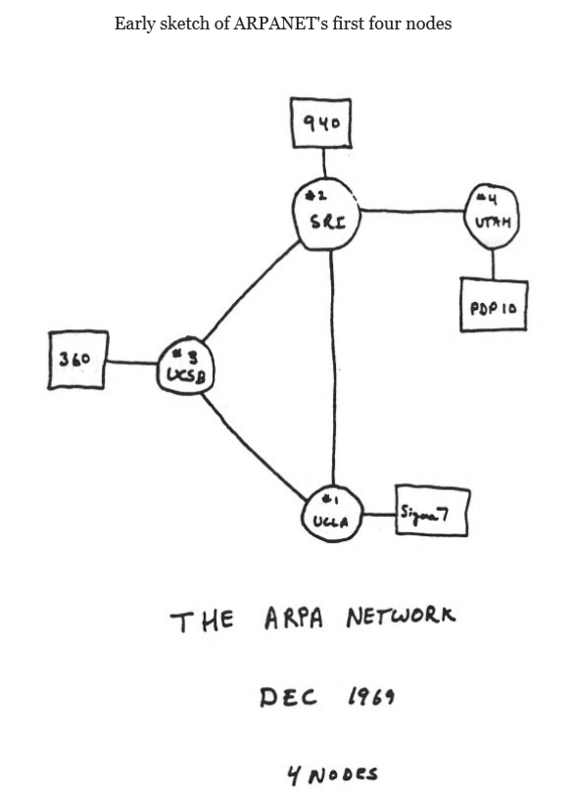 The sketch of ARPANET's first four connected nodes -- University of California, Los Angeles, (U.C.L.A. ), the Stanford Research Institute (S.R.I.) in Menlo Park, Calif., U.C. Santa Barbara (UCSB), and the University of Utah. The 1959 Class website tech is happy to report that she graduated from University of California, Santa Barbara -- one of those first FOUR nodes on ARPANET (Advanced Research Projects Agency). While graduating prior to the historic "1st Four Node" event, her first class in computing was taken at the newly established UCSB College of Engineering, the organization that led the event. From the Scientific American (2009) with Credit: COURTESY OF ALEX MCKENZIE : Forty years ago—on December 5, 1969—the U.S. Department of Defense's Advanced Research Projects Agency (ARPA) connected four computer network nodes at the University of California, Los Angeles, (U.C.L.A. ), the Stanford Research Institute (S.R.I.) in Menlo Park, Calif., U.C. Santa Barbara (UCSB), and the University of Utah. The "Sigma 7" note next to the circle depicting the UCLA node refers to the Sigma 7 computer at UCLA's Network Measurement Center that Vint Cerf connected to ARPANET. A write-up on the first message sent over the ARPANET (forerunner of the Internet) is discussed below. This seems so trivial today, but then... sending and receiving that first message... was exciting, no doubt. Deployment Historical document: First ARPANET IMP log: the first message ever sent via the ARPANET, 10:30 pm, 29 October 1969. This IMP Log excerpt, kept at UCLA, describes setting up a message transmission from the UCLA SDS Sigma 7 Host computer to the SRI SDS 940 Host computer. The initial ARPANET consisted of four IMPs: University of California, Los Angeles (UCLA), where Leonard Kleinrock had established a Network Measurement Center, with an SDS Sigma 7 being the first computer attached to it; The Augmentation Research Center at Stanford Research Institute (now SRI International), where Douglas Engelbart had created the ground-breaking NLS system, a very important early hypertext system, and would run the Network Information Center (NIC), with the SDS 940 that ran NLS, named "Genie", being the first host attached; University of California, Santa Barbara (UCSB), with the Culler-Fried Interactive Mathematics Center's IBM 360/75, running OS/MVT being the machine attached; The University of Utah's Computer Science Department, where Ivan Sutherland had moved, running a DEC PDP-10 operating on TENEX. Pete Stout is the Data Administrator & Content Manager and Elaine is the Web Architect handling the technical duties. Pete's Tech Support (aka, his wife) graduated from UCSB prior to the historic event connecting these four nodes, but her information technology career launched at UCSB led to a lifelong career and love for IT technology. She is forever proud to say that UCSB was one of the 4 original nodes on ARPANET...which led over the succeeding years to the societal-changing Internet.